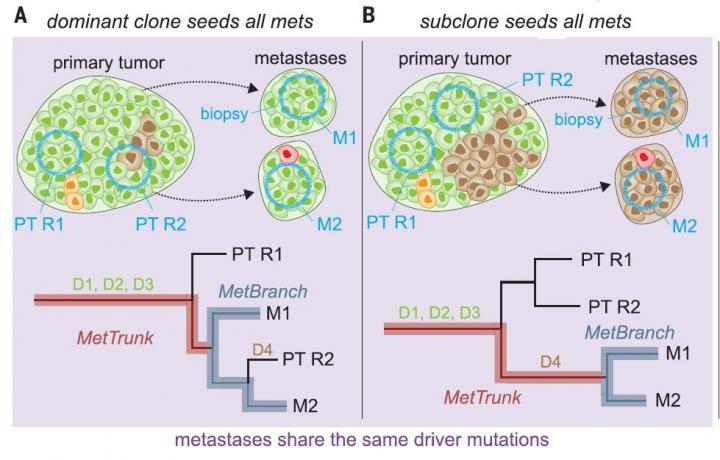 The report, "Minimal Functional Driver Gene Heterogeneity Among Untreated Metastases," looked at data from samples that have spread from the site of origin to another part of the body in 20 patients with breast, colorectal, endometrial, gastric, lung melanoma, pancreatic or prostate cancers. The researchers found within individual patients, driver gene mutations were common to all metastatic deposits. Bert Vogelstein, M.D., and Kenneth Kinzler, Ph.D., co-directors of the Ludwig Center at the Johns Hopkins Kimmel Cancer Center, and Rachel Karchin, Ph.D., from the Johns Hopkins Institute for Computational Medicine, were involved in this study. Vogelstein noted that though there are thousands of mutations in every tumor, the only ones that matter are driver genes. "If the driver gene mutations in different metastatic lesions from the same patient were heterogeneous, there would be little hope for new targeted therapies to induce clinically important remissions or cures," Vogelstein said. "Such therapies would shrink only a subset of the metastatic lesions, and the rest would continue to grow unabated. Fortunately, this does not appear to be the case, providing optimism for the success of future targeted therapies, particularly when combinations of such therapies can be used." "If numerous biopsies from different parts of the tumor were always required to capture this information, the task for the clinician and the discomfort to the patient would be much more challenging," Vogelstein said. This work was supported by National Institutes of Health grants K99CA229991, CA179991, F31CA180682, T32 CA160001-06, F31CA200266, U24CA204817, CA43460, as well as by the Lustgarten Foundation for Pancreatic Cancer Research, The Sol Goldman Center for Pancreatic Cancer Research, The Virginia and D. K. Ludwig Fund for Cancer Research, an Erwin Schrödinger fellowship, a Landry Cancer Biology fellowship, and the Office of Naval Research grant N00014-16-1-2914. COI: Kinzler and Vogelstein are founders of Personal Genome Diagnostics and are on the Scientific Advisory Board of Sysmex-Inostics. Vogelstein is also on the Scientific Advisory Boards of Exelixis GP. These companies and others have licensed technologies from Johns Hopkins, and both receive equity or royalties from these licenses. The terms of these arrangements are being managed by The Johns Hopkins University in accordance with its conflict of interest policies.